People believe anything they want it seems, they don’t engage in feedback with reality. “Your thoughts create reality!” “Consciousness creates reality!” Imagination is powerful, but we can’t instantly manifest material forms out of thin air simply because we think them up. Thoughts creating reality is valid through a clarification of that overly simplified erroneous statement, which means that our thoughts lead to our actions in the world, and the world is the reality we live in. If we change the way we act and what we do in the world, then the world becomes a reflection of what we all do if enough of us do it. The actions are the effect, with the underlying causal thoughts and emotions to drive them. No action = nothing. Action is what does the creating. Thoughts create in the mind, then actions create in reality what started in thought. Thought itself, or consciousness itself does not create reality, contrary to what some New Ager and pseudo-spiritualist people want you to believe. It is not simply that what we think happens. We have to choose which thoughts to ACT upon. 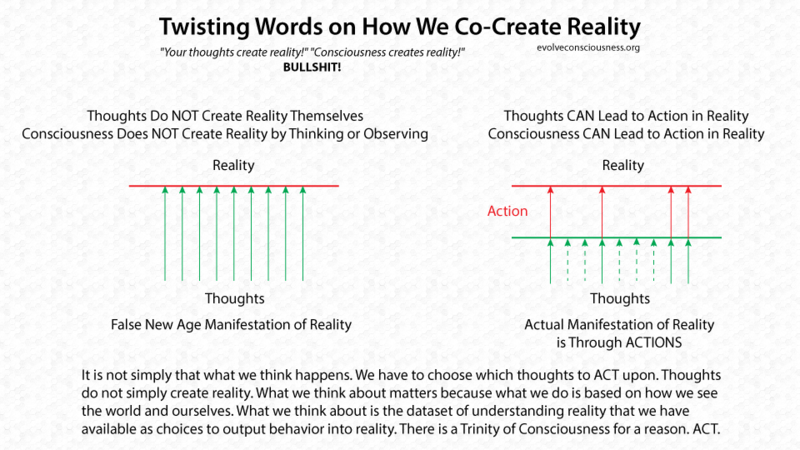 Thoughts do not simply create reality. What we think about matters because what we do is based on how we see the world and ourselves. What we think about is the dataset of understanding reality that we have available as choices to output behavior into reality. There is a Trinity of Consciousness for a reason. ACT.